In your ninth decade it may not come as a surprise to find death staring you in the face. But it might be unnerving if you’re an artist and a menacing “death’s head” skull emerges, quite unexpectedly, in an image you’ve been staring at and working from with close scrutiny for weeks and months. You might even take it, if so inclined, as a sign – if only as a sign that chance works in mysterious ways. 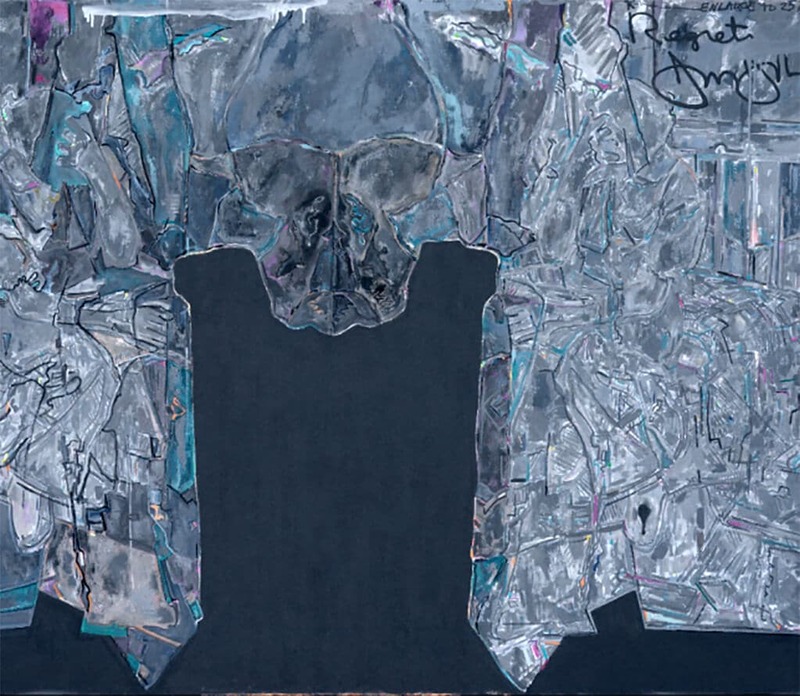 Jasper Johns has said he didn’t begin with the intention of a creating a modern memento mori, but, serendipitously, this is how it’s turned out. This cohesive series of drawings, prints and paintings, which he has called Regrets – a somewhat bathetic title for a series touching on mortality, but we’ll come back to that in a moment – was recently shown at the Museum of Modern Art, New York. In something of an unprecedented move, MoMA hastily cleared its schedules and arranged the exhibition before the work had even left Johns’ studio. 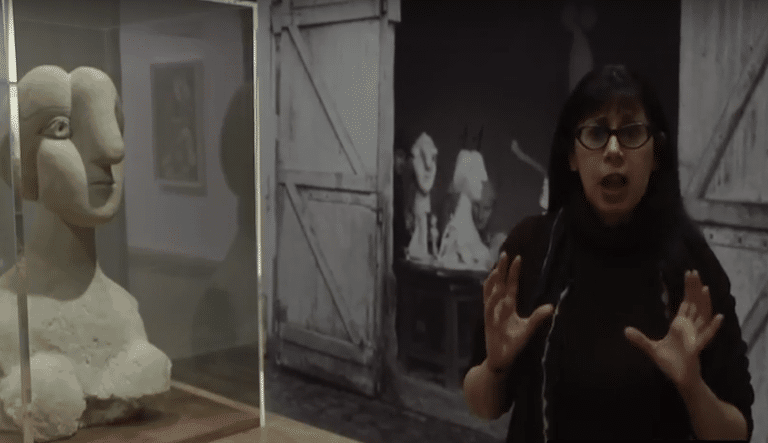 Of the 14 works displayed, 10 have now arrived at the Courtauld Gallery – minus two etchings and two ink-on-plastic (Mylar) drawings, as well as the original photograph on which the work is based. 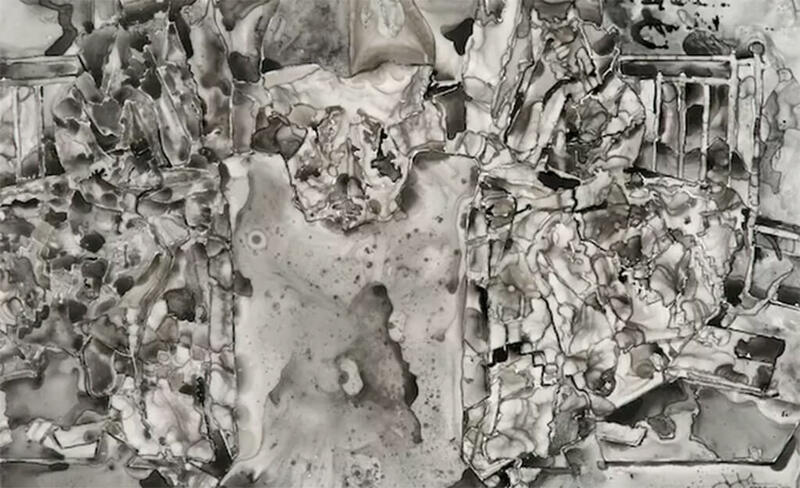 That black and white photo (pictured above) was taken in 1964 by John Deakin, the heavy-drinking Soho photographer who, memorably riffing on one of Francis Bacon’s pope paintings, took portraits of Bacon with two “angelic” carcass wings. Bacon, who disliked painting from the live model, asked Deakin to take some pictures of his friend Lucian Freud in a series of poses from which Bacon could work. And so, sitting on a brass bed covered with a patchwork quilt and with discarded newspapers at his feet, we find Freud hunched over and with one hand clasped to his head in a pose reminiscent of both Rodin’s The Thinker and the sleeping artist besieged by demonic owls and bats in Goya’s famous etching The Sleep of Reason Produces Monsters. 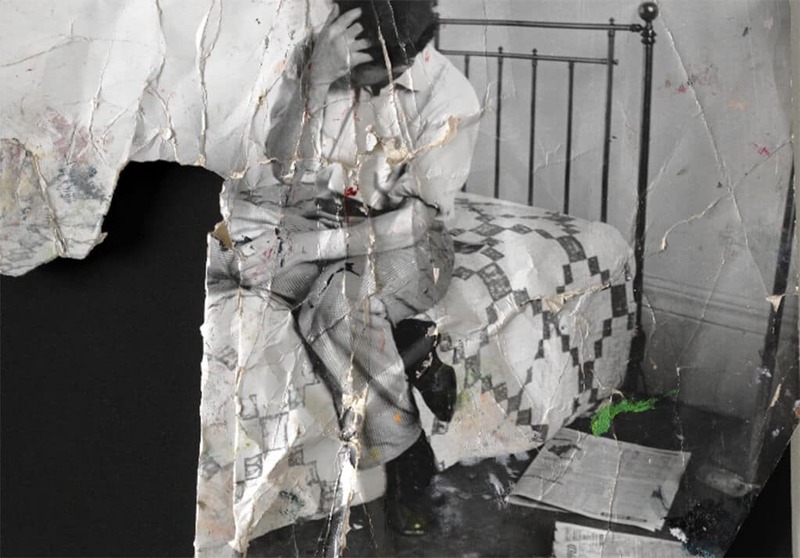 Found in Bacon’s densely cluttered studio after his death in 1992, the photograph seems to have been put to energetic use; it is creased and distressed and splattered with paint. The left and bottom edges are torn off or folded back, with a paper clip holding the folded creases in place. Where parts of the photographic print are missing, we see a black backing, as if the image has been consumed by a void. In its tattered state, it’s a magnificently powerful image. Drawn to the arresting image, Johns immediately set to work, producing first a sketch – jotting down three words, Goya? Bats? Dream?, on one – then a densely cross-hatched coloured-pencil drawing where the figure seems to take on the aspect of a jigsaw puzzle, or one of Johns’ coloured American maps. Eventually he mirrors the image like a Rorschach blot, with Freud’s figure facing itself in a symmetrical composition. With each process and with each new medium – pencil, watercolour, ink-on-plastic, oil paint, photocopy – Johns manipulates the figure in new ways, emphasising this or hiding that aspect of the original image. Of the finished pieces, we find ones that obviously work better than others, but, as a body of work, seen as a process, the unfolding sequence is completely enthralling. There’s such a keen, searching wit and intelligence at work behind these manipulations. That painting, at first glance, looks to be completely modulated in greys, then slowly gives up its subtle palette of blues, pinks and oranges across its ragged patchwork surface. But the most seductive works in the series are the two ink-on-plastic drawings, their surfaces an intricate and layered web of ink stains, the blots and delicate marks conveying the tension between chance and control (see picture left). The two here are beautiful. And of that slightly mawkish title given to the series? “Regrets” is how Johns signs off, with an efficient rubber stamp, all unwelcome invitations. Most of these works have been signed off in a similar way. The final invitation is, of course, one’s appointment with death, which, regrettably, one can’t turn down. But, in the event, what richly allusive work to sign off with.